One day my male colleague, the foodie, he told me of this awesome 'Mao Shan Wang' (a type of durian variety) or 'MSW' for short; flavoured ice-cream that he got from this new ice-cream parlour at Tanjong Katong Road. And it so happens, we drove along that very road the next day and he kindly stopped by the roadside and allow us to have a go. 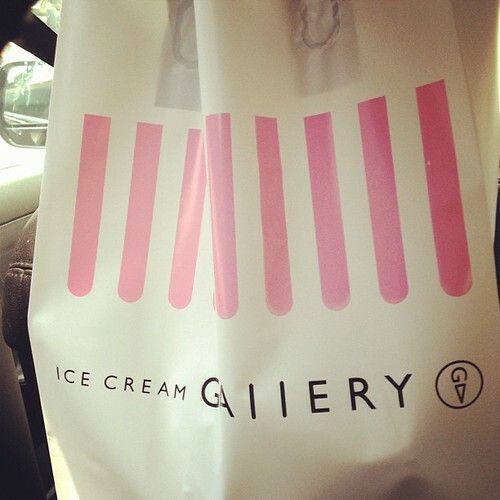 And right then, I had totally forgotten that it was from this ice-cream shop that he got the coveted MSW ice-cream. Seems like the flavours available on that day were the ones that were handwritten on the blackboard strips. Notice the 1st two flavours on top left? They had both D24 and MSW! 2 durian flavours. What's the difference, you wonder? 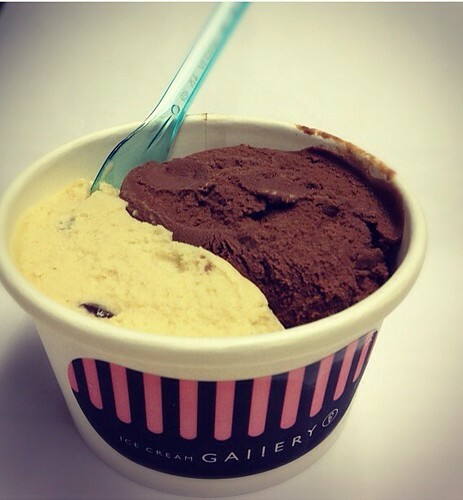 I sampled 2 flavours, both of which I chose for my 'double scoop' option, which cost $5.50. My 1st choice: the Salted Caramel & Almond flavour is a somewhat specialised variety so an additional 50cts is charged, per scoop. Later on, I saw THE flavour, in a covered tub at the corner. The Mao Shan Wang was placed neighbouring the D24 (both covered). I asked if I can sample it. That small sample scoop had me going, "WOWww…!" and all big-eyed at first taste. That was a very honest and spontaneous reaction, believe me. The servers chuckled, obviously amused. Even my colleague didn't expect my reaction but I remember her telling me, "Seriously, I can smell the durian when you opened your mouth just now…"
Obviously I chose that as my 2nd scoop. The MSW comes at and additional $1, though. Salted Caramel Almond and MSW? Hmm.. It was the Halloween week so they had some goodies carrying the 'horror' theme. 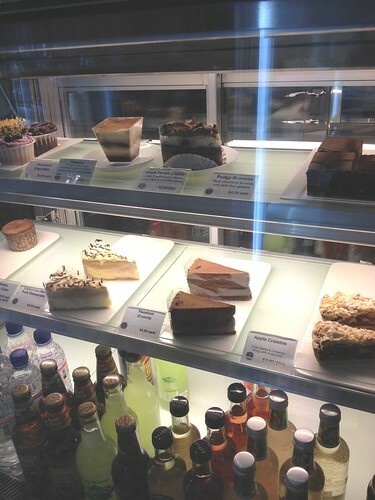 There were also some ice-cream cookie sandwiches and even some large ice-cream macarons sandwich (to verify??) at the bottom of the fridge. 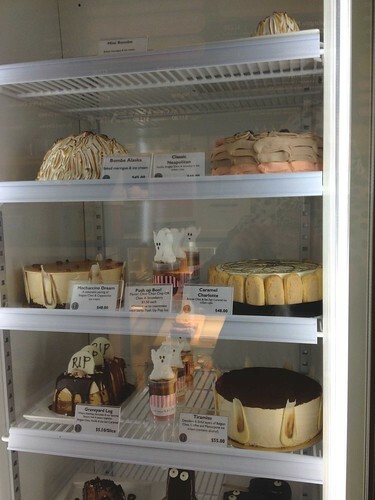 That Baked/Bombe Alaska (top-left) was soo tempting. Too bad that it's just soo big. It's there's one that small enough for 2, would have definitely gotten that one. Oh wait… there's one at the very top! Gah!! Non ice-cream desserts and beverages. She had the flavour that she sampled: Gula Melaka & Red Bean. Sounds exotic, eh? Tastes very much like 'chendol' (a popular S.E Asian dessert), minus those green bits. And the ubiquitous chocolate. This one here was Belgian Chocolate. Rich and dark (slightly bitter) taste. Complement the sweet Gula Melaka flavour nicely. I had to open my container outside the office. The strong durian scent… whoa! Even opened my office window but when my colleague stepped in, he remarked that he can definitely smell durian upon entering! This MSW ice-cream, in my own descriptions; taste just like the actual fruit being frozen, then the flesh extracted and mashed into a pulp. I can even feel the soft, fibrous texture of the actual durian flesh! The taste, the smell… Seriously, wow! Durian lovers, THIS indeed is it! I remember the customers that came after me in the ice-cream shop. They were sampling the various flavours and then asked which is the better one, between the D24 & MSW. The staff were quick to reply, "Of course the MSW!" I SO agree. And it makes me wonder why they churn out both flavours on the same day? 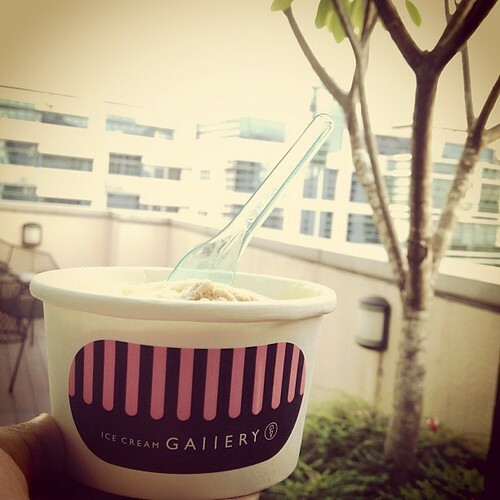 As for the Salted Caramel & Almond, which is another one of my newly-minted favourite flavour; it's was also good. Slightly sweetish with a hint of bitterness and the briny taste of sea-salt. Plus chunks of my favourite tree nut- almonds. Nice combo! And if you're wondering, how the MSW and Salted caramel taste like, side-by-side? Well, I'd say that nothing complements the other more. So glad I chose these 2 flavours despite it being an impulsive choice. The rich, sweet and overwhelming taste of the MSW being nicely 'neutralised' by the characteristics of the Salted Caramel flavour.